Core Description: The Clinical Research Computing Unit (CRCU) is a designated core research facility within Penn Medicine, specializing in clinical research informatics (CRI) collaboration and research IT services with a growing number of clinical and translational research investigators at Penn. The CRCU currently supports 58 funded projects, valued at more than $336 M (total costs, all years) to Penn. Although situated within the Center for Clinical Epidemiology and Biostatistics (CCEB), the CRCU supports an increasing volume of its research portfolio led by PIs external to the CCEB. This year the total value of these research programs was $ 243 M, so that the proportion attributable to PIs external to CCEB exceeded 70% ($243 M / $336 M = 72%). Established originally on April 1, 1997, within the Biostatistics Unit of the Center for Clinical Epidemiology and Biostatistics (CCEB) at the University of Pennsylvania School of Medicine, the primary foci were to develop a research computing base for the new program in Biostatistics, as well as to create the capacity and resources to compete successfully for data coordinating centers (DCCs) of federally funded, large-scale, multi center clinical trials, and epidemiological studies. These technology resources also permitted CCEB faculty and staff to provide essential collaborative CRI support for Penn investigators throughout the wide array of basic science and clinical departments, centers, and institutes, thus enhancing their likelihood of funding success. On July 1, 2002, the CRCU restructured its operations and expanded its focus in response to the overall research project growth within the CCEB and the University. 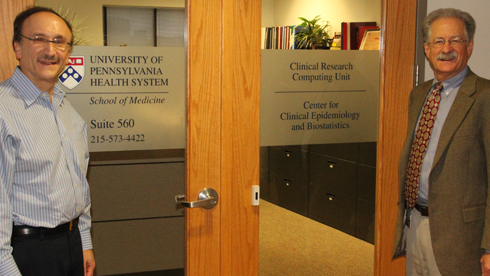 The CRCU, as an organizational unit, moved from within the Biostatistics Unit of the CCEB to a CCEB-wide organizational service center for both the Biostatistics and Clinical Epidemiology units. With this restructuring, the CRCU now has two faculty co-directors; one representing each of the CCEB units. The faculty directors ensure that the overall strategy and goals of the service center are aligned with the overall goals of the CCEB, as well as Penn Medicine. In 2005, the leadership model was expanded with the appointment of four (4) Directors of Operations, each of whom report directly to the faculty directors and manage a specialty sub-unit of staff to more effectively coordinate the evolving complexities of the more than 58 sponsored project teams. The original two (2) Senior Directors now focus their leadership efforts on technology infrastructure, new methodologies, special projects and fostering strategic collaborations with other Penn departments, commercial vendors, and other institutions. The University of Pennsylvania aspires to excellence in all domains. The CRCU embraces these ideals, as it partners with faculty and staff to conduct biomedical, behavioral, clinical and translational biomedical research at the highest levels of excellence. Advances in healthcare and improvements in quality of life through research depend on thoughtful science and uncompromising integrity in the collection and handling of information. The CRCU excels in the support of biomedical and clinical research by providing expertise in all facets of research information management, and by understanding the regulatory and cultural environments in which research is conducted. The CRCU fosters collaborative relationships with investigators in the CCEB, other Centers and Institutes throughout the School of Medicine, and across the University, to take an active partnership role in meeting their research goals. The CRCU is committed to continuous improvement in the expertise offered and the services provided, through an emphasis on education and training for staff and through the use of leading technologies and creative solutions.